Tilapia fish is readily available in Vancouver and adaptable to many styles of cooking. 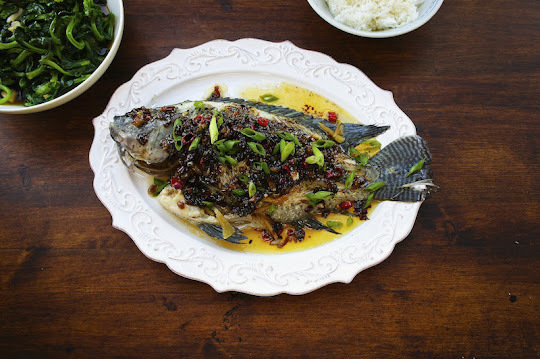 I chose to steam the fish whole and made a spicy sauce with garlic, chili, ginger, scallion, soy and oyster sauce. The sauce compliments the delicate flavor of the fish perfectly. Place the fish on a large heatproof plate, lightly salt the fish and scatter the julienned ginger, and steam over high heat for about 12 minutes or until the fish is fully cook. While the fish is steaming, prepare the sauce. Heat a wok over medium to high heat. Add the peanut oil, ginger, garlic, scallion, chili, and stir-fry until golden and fragrant. Then mix in the light soy sauce and oyster sauce. Give it a quick stir. Remove the fish from the heat, and discard the ginger. Then drizzle the spicy oyster sauce over the fish. Serve immediately with steamed rice.